The algorithm used for dose calculation plays a very important role in delivery of dose to patients undergoing radiation treatment. The beam configuration of analytical anisotropic algorithm (AAA) involves precalculated Monte Carlo data to determine all parameters to match the measured beam data. The AAA calculation uses accurate Monte Carlo-based three-dimensional pencil beam convolution superimposition for inhomogeneity correction. Algorithms can be divided into three classes based on their accuracy. Type "A" was proposed by Knöös et al. which were based on measurements and accounts for correction for patient contours and heterogeneities. Type "B" was proposed by Ojala et al. which were based on superposition and convolution techniques. The algorithm, Acuros XB (AXB), based on linear Boltzmann transport equation which was first implemented in the Eclipse treatment planning system (TPS) by Varian Medical Systems, Inc., (Palo Alto, CA, USA). comes under more accurate type "C" , algorithms. The origin of AXB algorithm designed for radiotherapy dose calculations is Transpire, Inc., (Gig Harbor, WA, USA). ,,,, Lloyd and Ansbacher  showed that the performance of AXB was better than existing clinical algorithm, AAA in high-density materials. Kan et al. showed the importance of options for dose to medium and dose to water in AXB in bone in the treatment of nasopharyngeal carcinoma by intensity modulated radiotherapy (IMRT) and RapidArc. Tomiyama et al. showed that Voxel Monte Carlo algorithm and AXB were better than AAA in stereotactic body radiotherapy (SBRT) of the lung. Similarly, Liu et al. showed that advantage of Acuros over AAA for treatment of SBRT lung. There were contradictory results on studies of lung cancers for planning target volume (PTV) coverage as well as sparing of the normal lung. Jiang et al. reported that volumetric modulated arc therapy (VMAT) was better than IMRT with better PTV coverage and sparing of normal lung by evaluating V20, V30, and mean dose (D mean ) for the lung. Rao et al. showed comparable PTV coverage using VMAT and IMRT. Ong et al. reported that IMRT was better than VMAT by evaluating V5 for the lung. The current study evaluated the differences in PTV coverage and in sparing of OARs when using the two different dose calculation algorithms AAA and AXB in IMRT. A 6 MV linear accelerator, Clinac 600C (Varian, Palo Alto, CA, USA) having forty-pairs multi-leaf collimator (MLC) with each leaf projecting 1 cm width at isocenter was used for the delivery of radiation treatments. A cohort of 15 patients diagnosed with non-small cell carcinoma of the left lung was taken for the study. All patients received a prescription dose of 50 Gy in 25 fractions. Thermoplastic sheet (Orfit) was used for immobilizing the patients. A Philips (big bore) computed tomography (CT) scanner was utilized for imaging patients, and CT images of 3-mm slice thickness were acquired with the patients lying in supine position. The CT images were transferred to the Eclipse TPS, version 13.6 (Varian Medical Systems, Palo Alto, CA, USA). The gross target volume (GTV), clinical target volume, the PTV, and the organs at risks (OARs) were contoured on the CT images by a qualified radiation oncologist following the guidelines of the International Commission on Radiation Units and Measurements report 83. Since the tumor was at the left side, the beams were selected from the left side only. Initially, the plans were created in AAA using IMRT technique with a grid size of 2.5 mm, and 7 mm margin was given around the GTV to account for lung motion during the treatment. For this, a template of dose constraints was created, and plan optimization was done using the created template. In addition, these constraints were changed to obtain minimum possible dose to critical organs without compromising the PTV coverage of at least 95% dose to 95% of PTV volume. One more set of plans was created using AXB algorithm, only by performing recalculation without doing any reoptimization. Thereby, in both the plans (AAA and AXB), all the plan parameters, namely, beam shape, beam angle, beam weight, number of beams, prescribed dose, normalization point, region of interest constraints, number of monitor units (MUs), and plan optimization were kept constant, and only the calculation algorithm was changed. The dose distributions in the PTV and the OARs in both the sets of plans were compared. [Table 1] shows dose constraints  for PTV and OARs used in treatment planning. where D5 is dose to 5% of volume of PTV and D95 is dose to 95% of volume of PTV. A value of HI closer to 1 points to a more homogeneous dose inside the PTV. CI = (TV95/V95) × (TV95/TV). where TV95 is the volume of PTV receiving 95% of prescribed dose, V95 is the volume of tissue receiving 95% of prescribed dose, and TV is the volume of PTV. A value of CI closer to 1 represents more a conformal dose around PTV with less spillage of dose. Statistical analysis of the data sets for the two algorithms was done using paired, two-tailed t-test and computing the P value. When P < 0.05, the difference between the two algorithms was considered as significant. 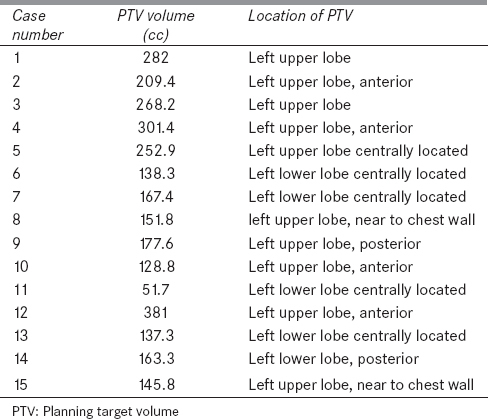 [Table 2] shows the location and dimensions of PTV for 15 cases. Mean of PTV was found to be 203.69 cc with standard deviation (SD: 84 cc). Mean values of OARs were left lung-GTV, 1163 cc (SD: 363 cc), contralateral lung, 1612 cc (SD: 564 cc), heart, 482 cc (SD: 202 cc), and spinal cord, 35.5 cc (SD: 18 cc), respectively. [Table 3] and [Table 4] show the differences between the doses calculated by AAA and by AXB. [Figure 1] shows the difference between dose coverage to PTV for a representative patient. [Figure 2] shows the deviation in mean dose (D mean ) for both the algorithms. Of the various assessed dose-volume parameters for PTV, D95, maximum dose D max , TV95%, and HI showed statistical significance between AAA and AXB algorithms (P = 0.01, 0.00, 0.01 and 0.04). Similarly, among the several assessed dose-volume parameters for various OARs, significant differences between the two algorithms were observed only for V5, V20 and V30 in left lung-GTV, D mean in right lung, D33 in heart, and D max in spine (P = 0.00, 0.00, 0.00, 0.00 and 0.00 respectively) as shown in [Table 4]. Dose at 95% of PTV, volume of PTV receiving 95% of dose, and HI were overestimated in AAA compared to AXB as reported previously. , Our results are comparable to that of Rana et al. who showed that more number of MUs are required for AXB to achieve similar target coverage in comparison to that of AAA. This typical dose coverage to PTV showing the difference in both algorithms is shown in [Figure 1] for a representative patient. As the plans were recalculated with the same number of MUs in both the algorithms (AXB and AAA), PTV coverage at 95% level with AAA was good whereas it was not so with AXB. This can be also seen by observing the variation in percent deviation in D mean for AAA versus AXB from [Figure 2]. Even though there is a statistical significance between AAA versus AXB, the mean difference is very small for PTV coverage as shown in [Table 3]. Similarly, from [Table 4], it can be observed that the OAR doses were slightly underestimated in case of normal lung (represents air) and slightly overestimated in case of the heart (represents muscle) and spine (represents bone) in AAA compared to AXB. Even though statistical significance does exist for V5, V10, V30 of (Lt.Lung-GTV), Rt.Lung (D mean ), Heart (D33), Heart (D mean ) and Spine (D max ), the difference between the two algorithms is less than 3%. Accuracy of AXB over AAA is well documented in literature. ,,, A limited study done by us, varying the size of PTV and OAR did not show any significant difference between the two algorithms. This study concludes that overall minor overestimation of PTV coverage in AAA compared to AXB algorithm. In case of OAR doses, mixed results were observed. Doses to the normal lung were slightly underestimated, and doses to the heart and spine were slightly overestimated in AAA compared to AXB. Even though statistically significant differences were observed between the two algorithms, the magnitude of the dose difference is too small to cause any clinical significance. The authors wish to thank Prof. Komanduri Ayyangar, Emeritus Professor, University of Nebraska, Omaha, NE. USA, for helpful suggestions. Papanikolau N, Battista JJ, Boyer AL, Boyer AL, Kappas C, Klein E, et al. Tissue Inhomogeneity Corrections for Megavoltage Photon Beams. Report of Task Group No. 65 of the Radiation Therapy Committee of the American Association of Physicist in Medicine. AAPM Report No. 85. 2004. Sievinen J, Ulmer W, Kaissl W. AAA Photon Dose Calculation Model in Eclipse (Whitepaper). Varian Medical System; 2005. Ojala J. The accuracy of the Acuros XB algorithm in external beam radiotherapy - A comprehensive review. Int J Cancer Ther Oncol 2014;2:20417. Gifford KA, Horton JL, Wareing TA, Failla G, Mourtada F. Comparison of a finite-element multigroup discrete-ordinates code with Monte Carlo for radiotherapy calculations. Phys Med Biol 2006;51:2253-65. Lloyd SA, Ansbacher W. Evaluation of an analytic linear Boltzmann transport equation solver for high-density inhomogeneities. Med Phys 2013;40:011707. Kan MW, Leung LH, So RW, Yu PK. Experimental verification of the Acuros XB and AAA dose calculation adjacent to heterogeneous media for IMRT and RapidArc of nasopharygeal carcinoma. Med Phys 2013;40:031714. Tomiyama Y, Araki F, Kanetake N, Shimohigashi Y, Tominaga H, Sakata J, et al. Comparison of dose calculation algorithms in stereotactic radiation therapy in lung. Jpn J Radiol Technol 2013;69:663-8. Liu HW, Nugent Z, Clayton R, Dunscombe P, Lau H, Khan R. Clinical impact of using the deterministic patient dose calculation algorithm Acuros XB for lung stereotactic body radiation therapy. Acta Oncol 2014;53:324-9. ICRU Report No. 83. Prescribing, Recording, and Re- porting Photon-Beam Intensity-Modulated Radiation Therapy (IMRT). International Commission on Radiation Units and Measurements, Bethesda; 2010. A phase ii0 trial of combined modality therapy with growth factor support for patients with limited stage small cell lung cancer, rtog0 task group report 0623, 2008. Tyagi A, Supe SS, Sandeep, Singh MP. A dosimetric analysis of 6 MV versus 15 MV photon energy plans for intensity modulated radiation therapy (IMRT) of carcinoma of cervix. Rep Pract Oncol Radiother 2010;15:125-31. Gurjar OP, Mishra SP. Dosimetric analysis of intensity modulated radiotherapy plans having one or more pairs of parallel opposed beams among the set of beams in some special cases. Radiat Prot Environ 2013;36:138-42. Bagdare P, Gurjar OP, Shrivastav G, Bhandari V, Gupta KL. Dosimetric analysis of intensity modulated radiotherapy (IMRT) and three dimensional conformal radiotherapy (3DCRT) for treatment of non-small cell lung cancer: A comparative study. Int J Cancer Ther Oncol 2015;3:3323.